Reigning Great Basin Conference boys’ singles champion Karl Wilander, a Wood River junior, lines up a winner during his straight-set No. 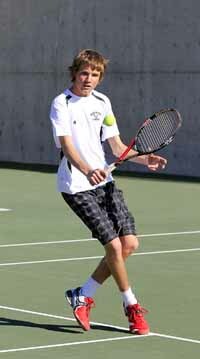 1 boys’ singles win over Jerome’s Albert Aguilar April 19 in Hailey. Getting ready for a challenging stretch of tennis before state-qualifying district competition in May, the Wood River High School tennis team handled the Jerome Tigers 10-2 last Tuesday in a conference meet. In its first home meet of the season, Wood River swept the six doubles matches and won four of the six singles matches. The Wolverine boys won their meet 5-1 and that was the same score favoring Hailey's girls. Wood River's No. 1 boys' singles Karl Wilander and No. 2 Josh Morell had quick matches, winning 6-0, 6-0 and 6-1, 6-1. In girls' singles, No. 2 Lily Richards prevailed 6-3, 6-3 and No. 3 Alex Feldman won her match by 6-1, 6-0 scores. Jerome junior Madison Blevins served notice that she'll be a contender at the May 10-11 Great Basin Conference tournament with a 7-5, 6-1 victory over Wood River's Erin Murphy in No. 1 girls' singles. In mixed doubles, Wood River didn't drop a game in victories by No. 1 Raleigh Grossbaum-Jessica Hamilton and No. 2 Bryan Donoso-Ellen Davis. No. 1 boys' doubles Gardner Cord-William Eagan had an easy time 6-0, 6-2. Sweeping girls' doubles were No. 1 Hannah Baybutt-Margaret Reutter 6-1, 6-0 and No. 2 Michaela Rodriguez-Audrey Brassil 6-4, 4-6, 6-0. Wood River (8-2 overall in dual meets, 10-0 boys and 7-2-1 girls) improved to 4-0 in Great Basin Conference league play. The Wolverines are entering a very busy seven-day stretch starting with Tuesday's league dual meet at Burley. The Hailey racquet team goes to the Capital Invitational Friday and Saturday, April 29-30 in Boise. A make-up home meet with Twin Falls is Monday, May 2 at 1 p.m. on the Hailey courts, then Wood River travels to Sun Valley Tennis Club Tuesday, May 3 for a 2 p.m. tri-meet with Minico of Rupert and The Community School of Sun Valley.